The Global Hemodynamic Monitoring Systems Market is valued $1,860 million in the year 2017 and is anticipated to grow at a CAGR of 7.5% from the year 2018-2023 to reach $2.27 billion. Among the different system types available, Minimally Invasive HMS is valued $1,134.3 million in the year 2017 and is expected to grow at a CAGR of 7.8% during forecast period. Non-Invasive Market is going to boost the coming future with increasing awareness and technological advancement. What is Hemodynamic Monitoring Systems Market? The HMS measures the blood flow, blood pressure and how much amount of oxygen present in the blood with in the cardiovascular system. This device detects the early changes of blood very deeply inside the body. Majorly it focuses on how well the heart is working. In addition, if the person requires any blood transfusion it informs priorly by testing samples of blood in the body and displays the amount of oxygen present in the lungs. This report incorporates an in-depth assessment of Industrial Gases Market by Product, System Type, End-User industries and Geography. Smart Hemodynamic Monitor: Smartphone plays an important role in our lives which can mitigate this difficult scenario with intelligent applications. The shape, time and respiratory variations of the pulsatile arterial pressure waveform are important for understanding the hemodynamic status. Capstesia is an innovative application of smart phones which can measure the cardiac index, cardiac output, pulse pressure change. It can be used for a great use in patient care and monitoring both in the operating room and the intensive care units. Portable Monitor: The ICON monitor is the first portable, economical monitor used for measuring cardiac output in babies, adults and pediatrics. Furthermore, it contains 2 hour battery life which has wide range of uses in medical emergencies, transport and situations pertaining to limited space. Because of its size it can be easily attached into any ground or air transport units. Smart Sensor: This provides convenience in determining real time cardiovascular status and hemodynamic, assisting guide with clinical decision making and effective management of critically ill patients. Therefore, the sensor called Cardioflo provides a cost effective substitute to the Flotrac sensor without giving away reliability or accuracy. Implantable HMS: The capacity to evaluate and identify the hemodynamic functioning of the heart is one of its key feature. The ability of sending the data over the Internet may allow heart failure patients to be monitored remotely, on an outpatient basis reliability of chest x-rays, physical symptoms and echocardiograms in monitoring the progression of heart failure. 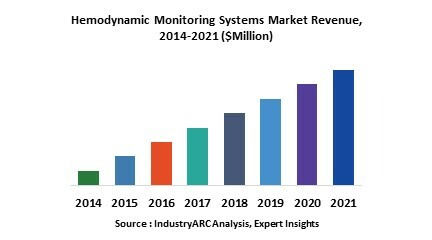 Who are the Major Players in Hemodynamic Monitoring Systems Market? The companies referred in the market research report includes Sonosite Inc., CAS Medical Systems Inc., Noninvasive Medical Technologies Inc., GETINGE Group, Philips Healthcare, DRAEGER, Vasamed, GE Healthcare Ltd and more than 10 companies.